My head is full of ideas and my goal is to focus! I often compare myself to a squirrel: I see something new, or “shiny”, and I zoom on it. I say it in a positive way, as for me, it illustrates my constant search and interest for new things, other things that may be useful at some point in the future. Collecting “dots” that I will connect later on. I say it knowing that the most common association of being a squirrel is lack of focus. A dear friend of mine uses it sometimes as a reminder to others in a team setting to “get back on track”: when someone is getting off topic, or too much into details, they shout “SQUIRREL” as a comical and friendly cue to refocus on the task at hand. They sometimes put a picture or an illustration of a cute squirrel on a wall as a visual reminder. I just saw an the TV commercial (2013 I think) that prompted me to right this post. It highlights the very positive aspects of squirrels which are great attributes to have in business today: squirrels are small, quick, persistent, efficient and AGILE! What do you think about being a Squirrel? Is your company a Squirrel Company? PS – Here’s the post where I saw the ad, which show other clever, and very funny TV commercials. How many times have you heard someone say, “It’s all about who you know.” Or who knows you. Or who remembers you. In business, large and small, you have to be in the top layers of the minds of the people you do business with, whether it’s B2B or B2C. People are the same. Look at the illustrations above. Imagine the names you see there are the names of people in your network. The bigger the name, the more you interact with them: meet in person, talk on the phone, exchange emails, follow each other’s social media, etc. But what about those little names? Those you do not keep in touch with? Those who do not know about what you’re doing? Who knows what they are doing right now? Who knows what they are planning? And that also means THEY do not know what YOU ARE DOING!!!!! Imagine your cloud of names with no bid difference in size. Some will always be bigger, of course. These people you deal with regularly because things are good between you and them. But you have to wonder what you, or them, are missing by not being in touch. How did I get to Organic Learning Experience? It started when one asked “What is your educational philosophy”? As this is not a day-to-day type of question, answering that question slowed the pace a bit, and it took a few moments to get the momentum back. What followed was an very interesting exchange of ideas. We went on to talk about the various strategies and formats we can use, how we come about to select them. Lots of talk lately about storytelling and engagement. We need maximum flexibility to adjust with context that changes. We never know exactly what will happen. How things will change. What “curve ball” will be thrown at you, as a designer or as a learner, when you least expect it. Agility then comes to mind. Do you fit your design with the tool(s) your learners like? Do you fit your learners to the tool(s) you think would work best? Do you gently introduce your learners to a new thing that they should like and engage in? This conversation popped these words in my mind: Organic Learning Experience. Or OLE! …a cry of approval, joy, etc. We constantly learn, from all kinds of inputs, delivered to us in all kinds of ways. It adapts to us and we adapt to them, depending on our extrinsic needs and intrinsic interests. Try to force someone into a fixed mold, and you will get either rejection or frustration: two things completely antagonistic to learning, as it deflects energy from it. It’s all about providing varied opportunities for learning, in terms of content and channels. We must provide access to informal learning opportunities alongside fixed, formal and planned learning interventions dictated by business requirements. We cannot keep being like the majestic oak who expands tremendous energy to stay up and hold its ground, because the ground is moving. We need to be as varied as the reeds and other flexible and adaptive plants surrounding us. I met Betty yesterday, and was totally inspired. She’s doing great things. Check it out. We all hear the word “agile” repeatedly. In all sorts of context. Project management, business, design, etc… Agility is a mindset. A mindset about two things: speed and change. Speed to get things one quickly to validate pertinence and value. Best example is Agility in product development, and project management. Most of all because we dont want to waste resources, and we want to get it out as fast as possible because it is in demand or you want to be first on the market. Change because it is constant. Everything is changing constantly: society and business. So the old days of over-planning are gone. Yes, you need to plan, you need a vision, a road map… but you need to test your ideas and assumptions as many times as possible, to make sure you’re on the right track. We know what has been, but we cannot be sure of what will be, at least not definitely. The target is always moving. To follow the target, we need to be agile. But what does it mean to be agile? This morning I saw the following diagram posted on LinkedIn by a few people (Marie Pineau, Romy Schnaiberg and Myriam Plamondon – see references below) which I believe is a good tool to answer that question. Come to think of it, this could be used to create an AGILITY Index, for individuals as well as companies. Each of the five aspects could be rated, even double-rated: self-rated and rated by others. Does it exist? Maybe I should build one. Would you use it? De Meuse, K. P., Dai, G., & Hallenbeck, G. S. (2010). 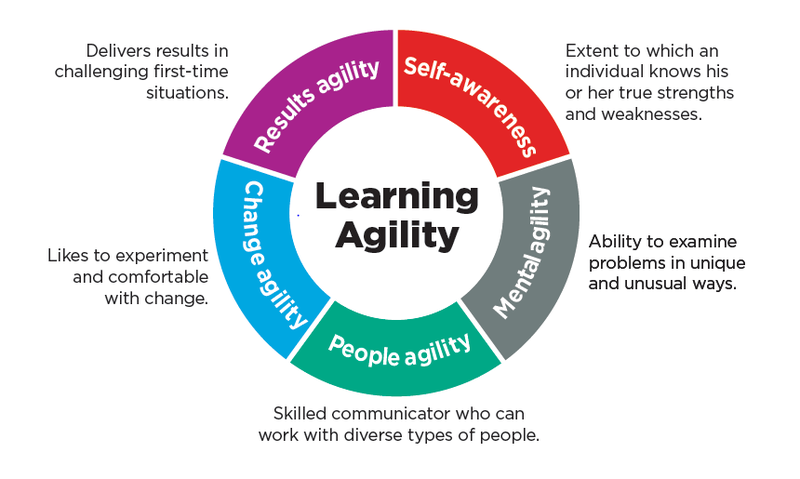 Learning agility: A construct whose time has come. Consulting Psychology Journal: Practice and Research, 62(2), 119. DeRue, D. S., Ashford, S. J., & Myers, C. G. (2012). Learning agility: In search of conceptual clarity and theoretical grounding. Industrial and Organizational Psychology, 5(3), 258-279. Reputation and trust are key. I started KATALYST5 with the goal of connecting people. Connecting those in need of services with the right people to do the best job that can be done. How does KATALYST5 know who is the best person to do something? We start simple, by identifying what needs to be done for a specific job and then we selecting who – if there were no restrictions – would be the absolute best person (or people) to complete it. We base our selection on their knowledge, experience and skills, but also, more importantly, because on knowing these people love doing exactly that work that needs to get done. Once we have a list of candidates, we look at their availability and their cost. We may negotiate certain aspects of the job like calendar or budget to make it work, and if it’s a match, then great! And if it doesn’t, well, we move down the list until we do find the right match for you. But here’s a question to you: Why do you hire a specific person? Do you just look at a sheet of paper, examine their resume, consider their pedigree? Of course not. You will eventually want to meet with and talk to that person to discuss your needs because, at the end of the day, you don’t hire a company, you hire the people in that company. And yet, even then, can you ever be sure what kind of service you will get from that person? As we know all too well, ineffective people can still be very effective at selling themselves. We’ve all heard horror stories of business relationships gone bad, even though they started with great expectations based on a few chats and meetings. So while you should consider hiring the person and not the resume, how can you really be sure if you do not know that person? The answer is reputation. We all need to look at reputation. What do others think of the person you are considering? Sure, you need to do your homework, and not just make a quick phone call to that person’s friend. And, in asking around, if you hear things that you don’t like, due diligence sometimes requires that you take other people’s words with a grain of salt. See, reputation is based on the input of others. Trust, on the other hand, is based on your personal experience. So here’s another word: trust. But without personal experience, if you’re hiring someone you don’t know, how can you trust them? Someone’s reputation only becomes trustworthy when you hear about it from someone you yourself trust. I call it inferred-trust. Change is constant, but the pace of change has accelerated in the last decade. Technological innovations, climate change, political turmoil, and… people of course. We change a lot because of what we learn, what we adapt to, and what we get overwhelmed by. And back to my point again: reputation. Reputations change, because people change. For the better and, sometimes, for the worst. So we each have to take care of our reputation. Protect it and nurture it. In a world of constant change, filled with people who don’t know who we are, it is all we have to make these people trust us. And the best way to do it: be humble and empathize with others.